Weekly Technical Outlook for the currency and commodity markets. Euro: After falling steadily for nearly four weeks, the euro retraced its gains the week before. 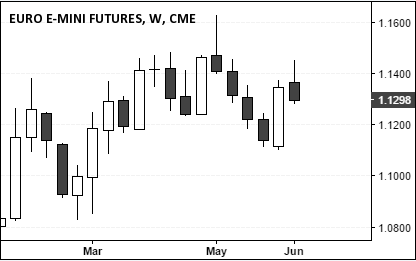 However, last week saw prices testing the highs above 1.140 but failed to gain higher. As a result the euro fell, to close the week at $1.1298. The retracement to 1.140 this week marks a correction to the upside and we could anticipate near term weakness to continue. The next key levels to watch out for are 1.120 and 1.10. US Dollar: The dollar has managed to recover, closing the week on a modestly bullish note. But the gains were not strong enough. Price still remains weak and could see some consolidation in the near term. 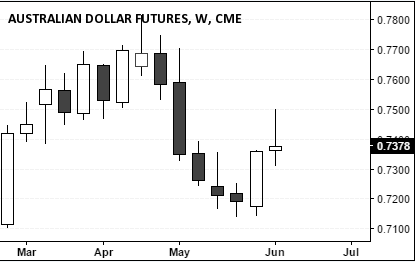 A break above 96 will see the dollar rally to 98.00, while to the downside, 93 – 92.5 remains an open support that could be targeted. 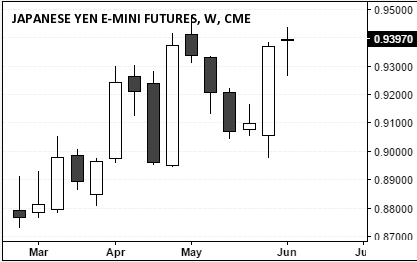 Yen: The Japanese yen has seen a similar move to that of the euro, rising this week to correct the previous weeks declines. But with the doji close this week, we can expect a possible trend continuation or a change of trend in the near term. The bias is to the downside, considering that the yen has failed to post any new swing highs following the top above 0.95, 5-weeks ago. New Zealand Dollar: The New Zealand dollar posted a new one year high this week, briefly trading at 0.7148 before pulling back to close the week at 0.7056. Further gains are expected with the Kiwi potentially challenging January/February 2015 lows near 0.720. However, such a move is likely following a pullback to 0.68 support. 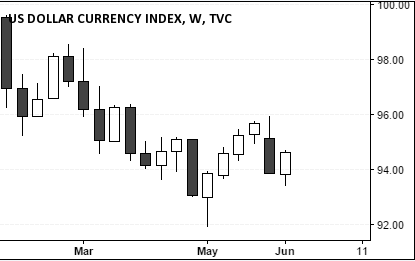 Australian Dollar: The Australian dollar posted a 4-week high trading at 0.7504 but fell back sharply to close the week with a spinning top/doji candlestick pattern. Prices are looking bullish, after posting a higher low above 0.72 just a week ago. A break below 0.72 if challenged could see the Aussie fall to 0.70 and could potentially invalidate any upside bias. Swiss Franc: The Swiss franc has rallied for the second consecutive week, perhaps reflecting the on going market uncertainty. The franc rose to a 4-week high, trading above 1.03, closing the week at 1.0383. Any pullbacks are likely to be limited to 1.02, below which, the Swiss franc could test March lows of 1.00. The coming week, the Swiss national bank will be meeting. No changes are expected with the SNB likely to leave its 3-month LIBOR rate at -0.75%. 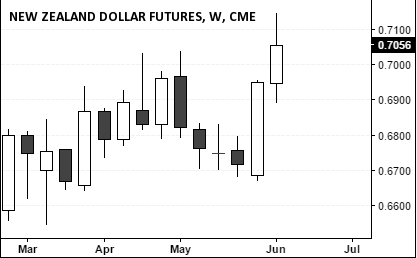 However, SNB Chief, Thomas Jordan will likely reiterate that the central bank will remain ready to intervene if the franc rallies too much, a likely move ahead of the Brexit referendum. 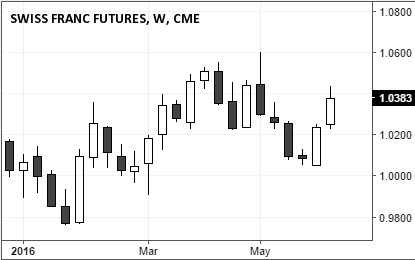 WTI Crude Oil: Nymex Oil futures touched a new high this week, at $51.67 a barrel, but failed to hold to the gains. For the week, Oil futures fell back to close at $49.07. 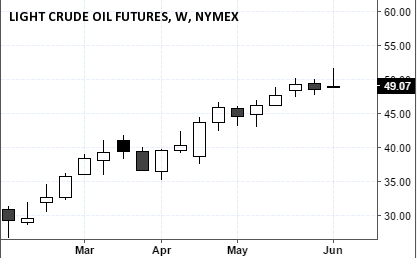 In the longer term, the resistance near 50 – 48 is likely to play a role with Oil prices likely to see a retracement if this week continues to push lower. Next support is found near 42 – 40 levels. 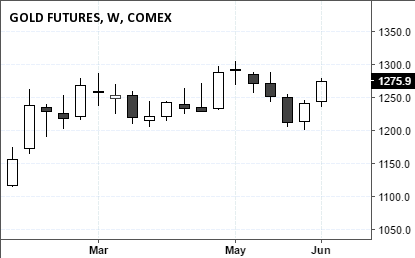 Gold: Comex Gold futures are bullish for the second week in a row with prices closing on Friday at $1275.90. 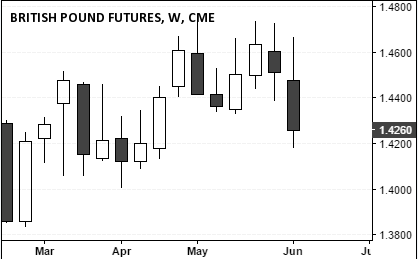 The two week gains now retrace over 60% of the declines from the preceding four weeks of declines. A bullish follow through is required here, and potentially a close above $1300 an ounce for prices to confirm further upside. Alternately, failure to post a new high could shift the sentiment biased to the downside. Watch for support at 1220 – 1200. PrevWhat is ‘Helicopter Money’ Policy?